The embattled chairman of the independent Chemical Safety Board took to the pages of the New York Times last week to step up pressure on federal workplace health regulators to issue a new rule on dangerous dust. 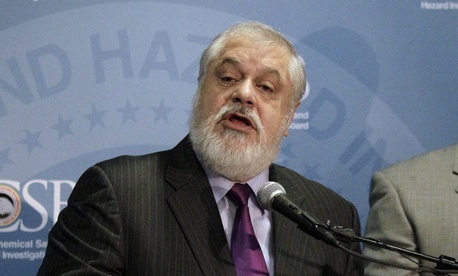 Rafael Moure-Eraso, whose management troubles prompted calls for his resignation at a House hearing in June, highlighted the recent explosion in a Chinese metal products plant that killed 75 people and injured 185. In the United States, from 2008 to 2012, the board documented 50 combustible dust accidents that led to 29 fatalities and 161 injuries. “Following a study that our board conducted in 2006,” wrote the chairman of the agency that evaluates other agencies’ regulations, “we recommended that [the Occupational Safety and Health Administration] establish a comprehensive combustible dust regulatory standard for all industries. The following year, it developed an enhanced enforcement program, but the critical component—a national standard with clear requirements—has yet to be created,” Moure-Eraso wrote. The Labor Department agency’s agenda anticipates a new rule initiated under the Small Business Regulatory Enforcement Fairness Act at the end of 2014.